Some horses are so tame that nothing fazes them. Others will go ballistic at the slightest pretext. Most are somewhere in between. When you see a horse, assume first that it is on the flighty side. Ask the rider if it is OK around mountain bikes and if there is anything he or she needs you to do. Often, equestrians prefer voice alerts over bells – the human voice helps the horse identify the cyclist as a friendly human and not a potential threat or predator. A greeting such as, “Hi! Great weather today!” is appropriate coming from in front or behind. 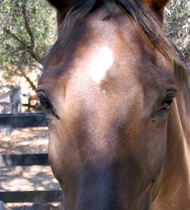 Horses recognize the human voice as safe and a spoken salutation helps offset the potentially threatening appearance of a bike. On tight single track it is best to get off your bike and let horseback riders pass. Get off on the uphill side so that the horse can’t slip down on you or kick you. 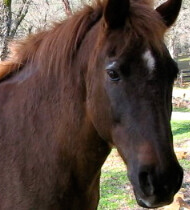 You can also look for a few symptoms that will clue you in that a horse is nervous. 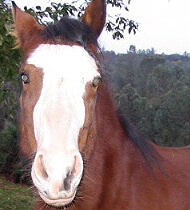 Horses are fidgety and susceptible to other horses’ behavior. If a horse is halted on a narrow trail it may not necessarily stand still, and it may lose its footing causing it to attempt to save itself from falling down a slope. This in turn will agitate other nearby horses that interpret the situation as dangerous. Some horses may try to turn around. This can be treacherous for the horseback riders. The first clue is the ears. Pointed ahead they are in the “alert” mode. This isn’t necessarily bad. It just means the horse is paying attention. Ears laid flat back against the head mean the horse is in a nasty mood, and probably about to bite or kick. Sometimes a horse will flick its ears back and forth slowly. This means it’s on mental cruise control, and possibly trying to keep flies from landing. A more significant clue, but one that requires being closer, is the eyes. If they are rolling and really wide open, look out. Half open, the horse is relaxed. There are other clear indicators of agitation. A horse that is prancing, sidestepping and snorting is obviously close to coming unglued. 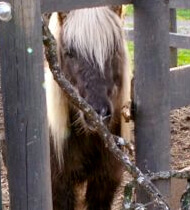 A twitchy, swirling tail is another indicator of equine anxiety. 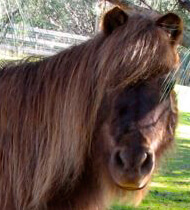 If you do see a horse in an agitated state, move slowly away if possible, and talk in a calm voice. Do not make any sudden moves. The rider will probably give you directions. But don’t assume, if the rider says nothing, that you are being ignored. It might be that horse and rider are deep in conversation, one you can’t hear because the rider is “cueing” the horse nonverbally, with subtle pressure of knee, heel, toe and reins. 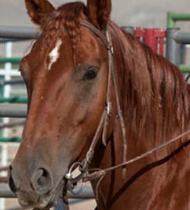 Horses are prey animals and have been bred only recently into large animals. In prehistoric times they were much smaller. Horses may still think they are small. Even though to us they are truly powerful and potentially dangerous animals, horses don’t see themselves this way. Therefore it is erroneous to assume that a horse has confidence and a sense of security just because it is big and powerful. Small, seemingly innocuous things will spook them. When a rider is perched on the back of a scared horse, it can be a precarious situation. Horses are farsighted, so things up close are blurry. They cannot see directly in front or behind themselves. When a bicyclist comes around a blind corner and suddenly appears within 50 ft of the horse, the horse cannot readily identify what is heading towards it. Since the horse is a prey animal it is normal behavior for it to flinch and desire to flee. Obviously this is not good for any rider on its back. Remember also that just as there are beginning bicyclists, there are rookie equestrians. Just as we lose control of our bikes, some of them may not be in full control of their animals. In the parking lot, try to be considerate of the needs of equestrians. One former riding acquaintance (and he is “former” because of this incident) pulled his car right behind a horse trailer, making it impossible for the riders to load up without moving their rig. When I pointed this out to him, he said that he had done it on purpose. I didn’t say anything at the time, but never rode with him again. Today I wouldn’t be so shy. I see people like that as jeopardizing my access to trails, and they deserve to be chewed out for their stupidity. Another consideration in the parking lot is for the space a pickup and trailer needs to maneuver. Try not to crowd turnaround and parking spaces. 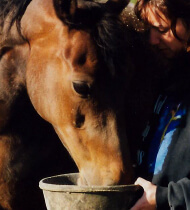 Getting on with equestrians is a matter of a little knowledge, consideration, common sense and awareness. And getting along with equestrians increases our chances for sharing trails, so it’s well worth the effort. But if you really want to gain an understanding of the equestrian’s point of view, try riding a horse. It may not be the same feeling as gliding down a smooth stretch of singletrack, but it’s a lot of fun. And the hills are definitely easier. 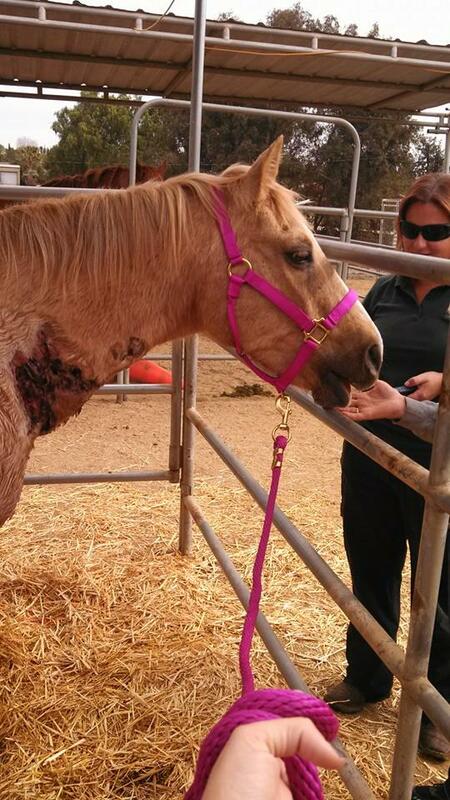 Xena is hanging in there and doing her best to heal… She has a new pink halter! Click to read her story! FRIDAY IS UPDATE DAY: Bodhi’s gash popped open! BODHI UPDATE… IT IS HEALING! Ok, I am adding another comment. After carefully reading the other comments on this video I have seen one thing pop up over and over. “Mountain bikers are bad because they scare the horses! They should be banned from multi use trails!” WHAT! Okay, I am really trying not to sound like a hater but you know the risk when you hop on a two ton animal’s back. I have witnessed horses getting spooked over things as simple as sticks or plastic bags. Whenever I am coming up behind a horse, I always say “Hey!” Or something to let the horse know where I am. I go very slowly around the horse to avoid scaring it. After one such occasion, when I rode off, I heard the riders talking about “F****** mountain bikers, riding multi purpose trails”. (My home trail was originally a mountain bike trail that changed to a multi purpose.) I looked back to find a middle finger pointed in my direction that was quickly pulled away. I have passed many horses on my rides and only one rider was even close to friendly with a quick hi. You equestrians know the risks of hopping on that saddle just as us mountain bikers know the risk of hopping on our mountain bikes. The problem I stated in my last comment was about the poop. Ok, shoveling up your horse’s crap every five minutes might be impractical but a poop bag is not. When you see horses at the beach they wear poop bags so why not the trails. “It’s good for the environment!” I would like to see how much those horse riders would like it if they were cruising down a trail at 20 mph, running over a land mine, and finding the “fertilizer” all over the back of their shirt. It is disgusting and unless your trail is in a major drought, totally unnecessary. That combined with last years poop caused injury. (Sprained wrist and minor concussion.) I have a hatred for horses that take to the MTB trails. Us mountain bikers call a trail with regular horse use “Horse f****d” as the trail is littered with disgusting crap. Stay on horse trails equestrians or get a poop bag!!!! And don’t hate on the mountain bikers for riding a trail that horses ride on. Although I can’t speak for all mountain bikers, I treat horses with respect when I am on the trail so don’t flip off the mountain bikers for existing. If your animal is spooked even though the mountain biker does everything he/she can to not spook it, that’s on you equestrians for deciding to ride a two ton animal on the trails. Good article, only one thing you should have mentioned. My home trail is a multi use trail which means horses. I have only one problem with this. HORSE POOP!! Picture this: you are about to hit a technical black diamond trail. You start the trail and begin weaving your way through boulders and roots. Then… a land mine. A massive pile of horse crap blocking your path. Panicked, you grab a fistful of brake, go over the handlebars and find yourself in the ER with a terrible headache and an ugly gash on your arm. That is a true story I am sorry to say. To all you horse lovers out there, PLEASE CLEAN UP AFTER YOUR HORSE!!! Or at the very least, put one of those poop bags on your horse instead of leaving it there like a massive land mine. I’m sure the owner of the horse that stopped me riding for a week had no intention of causing injury, but due to most horse owners carelessness when it comes to their horses’ crap. I have joined a growing group of mountain bikers with a passionate hatred of horses. I passed ONE HORSE on a ride a few months later and saw not one, not two, but three fresh crap piles of pony goodness. If you ride horses on mountain bike trails, please do something about your horse’s poop or you may find yourself the culprit of a mountain biker’s injury. The underlying message here is mutual courtesy and respect. What’s the most reasonable, practicable and safe and/or legal option? Equestrians and cyclists bear the same burden of responsibility, courtesy, and respect regardless of the venue. What cyclists really must remember, and I know it’s already been stated here, is that if a horse sees a fast moving cyclist coming up from behind before the rider, the outcome is often traumatic. Their eyesight is much different than ours. As a cyclist, I ask that you take a few minutes to look up and understand the visual capacities and limitations of horses and understand why the riders must be particularly vigilant and aware of any emerging threat. The cyclist has no way of knowing who saw them first so it’s far better to err on the side of caution and pay attention. It only takes one act of indifference, a moment of inattentiveness to cause irreparable harm to an involved party. Both groups are much more likely to incur direct harm on the road or trail than our vehicle operating counterparts. Is it so much to ask that we recognize and respect the vulnerabilities of both groups and act accordingly? Please, as someone who loves her family and life (especially after my near death a month ago) consider at least taking a few minutes of your life to understand the equine’s perspective in the matter at hand. I find it borderline offensive that it’s presumed that cyclists are responsible for the mental stability of your animal. We’re riding machines, that we are required to maintain control of or be liable for our loss of control and the damages done… yet it’s ok for you to write off your 1200lb beast as ‘skittish’ or ‘flighty’ and demand that all other trail users yield to you. If your dog is aggressive towards o other dogs, you don’t bring him to the dog park… if your horse is unstable around bikes, don’t bring him to multiuse trails. I’m surprised at all of the nasty comments towards bikers!! I’m an equestrian and a biker. I’ve yet to meet a fellow biker that want more than willing to hop off the trail to let horses pass. There have however, been many times where we have done everything right (dismount and leave trail, talk as horses pass, wish the riders a good day) only to be cussed at by the equestrians. Chivalry is a two way street. Well written article! If everyone would keep common curtsy foremost in their minds – trail users would enjoy their experience even more & make new friends too! Great article except where you noted Bike rider (or Hiker) stand BELOW THE TRAIL – NOT ABOVE! I will be sharing this as I am equestrian and a member of the Back Country Horsemen of America, local Chapter is San Juan Back Country Horsemen in southwest Colorado. As an avid mountain biker and trail builder who has tried to remain respectful in spite of having to dodge piles of horse poop on every trail; I’m growing tired of this one sided conversation. Both bikers and equestrian folk are an equal danger to one another and both have invested plenty of money and time into enjoying their respective hobbies. I feel that if we would see a bigger commitment from the equestrian group to keep the trails “clean” and maintained I’d see this as a win for both rather than a one sided whining session. 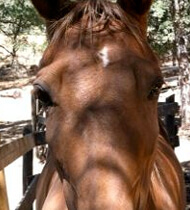 as much as I hike and ride mountain bikes as much as possible (four or five times per week at least) I ((love)) horses! What I find works well when I’m mountain biking on trails is to simply stop and dismount my bike. 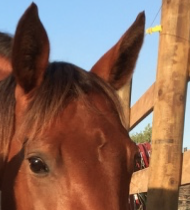 I talk to the riders in order to both be polite and assure the horse that I am nothing unfamiliar to said rider – thus assuring / comforting the horse. In hundreds of encounters, this basic strategy has worked every time. Great article. Thanks for sharing and educating ALL riders. Yes, everyone needs to understand the other person’s sport. Most importantly, we ALL have the responsibility if keeping everyone safe! One woman, who encountered 3 Mt. bikes in a wilderness area, is now permanently disabled, in a wheelchair for the rest of her life. What a wonderful article. As a horsebackrider, I can confirm horses are basically dumb flight animals. Some are better than others. We all, dirt bikers, riders and bicyclists need to learn to unite and share the space as cagers, drivers and urbanites are building us out of our open spaces and past times. I do not fear or dislike dirt bikers or bicyclists as I’ve met some very nice, polite ones and others who were just under educated. We need to learn to unite and work together. PS I always move way over and slow down when I drive past a bicyclist. I live off of Angeles Forest Hwy in Acton, CA and you cyclist are some brave folks driving that road!! I am a rider and also a walker, and I know a lot of cyclists. The problem with cyclists is that they love to complain about how cars don’t “respect” them, but we have a trail for everyone nearby that runs the length of the county, and the bikers on it don’t respond anyone else (the walkers, skateboarders, little kids, old people with dogs, etc.). They ride 3 abreast and take up the whole trail and expect everyone to step aside for THEM etc. Yet they don’t see how hypocritical it is. They are all like that. I don’t like cyclists! I have been riding bikes in my area for over 30 years. I have never had an issue at any time with the thousands of encounters I have had with both hikers and equestrians. I have always made sure to use a bell and call out my intentions. Common sense and common courtesy have served me well. My problem however is that a certain user group that makes up less than 1% of the trail users likes to try to dictate trail access and acceptable behavior to the rest of us. This particular user group is always more than willing to accept the thousands of hours of volunteer trail work our international and local cycling groups do to multiuse and single use trails but when we try to gain access to more trails or try to have single use trails built for ourselves or even bike parks they turn out in droves to fight us. Quite frankly we are growing a bit tired of it. I have no problem sharing my trails with hikers, runners, horsey folks or anyone else but please, stop making stuff up. Bottom line, you choose to bring an unpredictable animal out onto trails where you could encounter any number of crazy things that may make it go ballistic. I have seen horses go ape over plastic bags, paper plates and pie tins. Stop making your lack of control over your animal my problem. Equestrians have used every trick in the book to try to ban bikes from trails for their own selfish reasons. Equestrians have access to over 90% of all trails while they represent less than 1% of all trail users. Again, I have no problem with that at all, I think they should be allowed to go where they want but please stop trying to get bikers kicked out of every national park or open space preserve. You guys already have all designated wilderness trails to yourself. Bikers are a legitimate, environmentally sound, safe user group. We enjoy and love the trails as much as anyone else and we will fight to protect it for the same reasons. Please stop making an enemy of us. Horses have the right of way on our forest preserve trails in Chicagoland. Most bike riders are respectful as far as their knowledge of horses goes. However, there are a lot of ignorant people. I have found the best way to get their attention is to tell them they could get severely injured if the horse kicks them. I ask them to call out and slow down as they approach, especially from behind. Runners are actually worse and come much closer to the horses. They are mostly men so I say something like, ”How would you like to be kicked in the crotch by a horse?” That gets their attention. I am an equestrian and also ride a mountain bike. Lynne has good advice for equestrians. My wife and I rode horses on a multi-use community trail for 15 years. W started in the arena with a neighbor on a mountain bike until the horses were desensitized to that (3 15-minute sessions). On one of our first trips, we enlisted the help of a friendly biker who rode back and forth past us about ten times, working up to a skidding stop 20 feet in front of the horse. He was glad to help and understood that we were trying to be responsible and respectful users of the trail. We had a couple close calls over the years, but the more exposure our horses got, the safer everyone was. We have friends who don’t ride in the community forest because their horses are scared of bikes. That’s another option – don’t ride where bikes are allowed. We have shared trails where we ride in Michigan as well. But in Michigan there is a law…horses with riders are Pedestrians and we have the right of way. On trails, roads, etc. Unfortunately, a lot of people do not understand or know about that law. Most of the mountain bikers I have met on the trails are polite and more than willing to move off the trail to let us pass. I have met some that are not as polite, but in all fairness I have had people on gaited horses about run up my horses tail as well and are not always polite about me being on an ungaited horse that does not move as quickly. Two years ago a friend of mine was put in the hospital after a mountain bike rode up into the tail of the end horse in a line of 4 horses. Lucky for the biker, the horse at the end didn’t kick the crap out of him. Some horses would have. However, it did upset one of the horses who bolted and his rider came off and was taken out of the woods by ambulance. It is common sense. No one “Owns” the trails. And if we are made to share them, be smart. That horse can really hurt the rider or the biker. Slow down, if you want to ride fast on your bike, find a mountain bike only trail. DON’T wear ear buds and turn your music up so you can’t hear us coming either. We all need to be willing to be nice. Equestrians and bicyclists are not compatible user groups. It is a disaster waiting to happen. Equestrians and hikers are compatible and have few problems sharing trails. Mountain bikers do not belong on multipurpose trails. They are rude and self absorbed. In Cook County Illinois we horse folk have to pay upwards of $40 a year for two licenses to use the trails. Other trail users pay only what comes out of their property taxes, as do we. Our trails were built as BRIDLE PATHS and it was with trepidation that we welcomed bikes and other users in the mid-1990’s. The mountain bikers immediately began to use anything they thought was a trail: deer paths, water courses, paths that the horse folk knew not to use or not to use when it was wet. The erosion was unbelievable and then the bikers blamed US!! We have gotten past all that and most bikers are polite and some we even ride together with on the trails. So to ask us to pick up our horse’s droppings and shove bags (very scary for most horses!) in our faces just isn’t the way to share the trail. 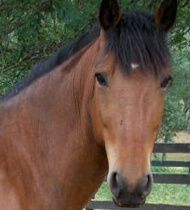 Horse poops disintegrate in hours in wet weather and a few days when dry. It is fertilizer for the woods. Other users’ trail garbage sticks around until groups who value the pristine quality of nature make the rounds and pick up the trash. Nobody is saying those people should not use the trails. But the the horses are continually under fire. My point is that all trail users have to respect one another and respect the trails. We can and do get along if we all make the effort. Let’s remember why the trails were built and make that effort. Also, ride on trails that are designated for your use. If you’re cycling on a trail that’s mark hiking & equestrian, or riding on bridle paths…these users are there because they may not want to have a multi-use experience, or, this trail maybe unsafe (poor lines of sight, too narrow) to support cyclists too…you are also confirming to land managers that organized cycling groups cannot control their users. Additionally, the equestrians & hikers will report you. Great article. This is all very sound advice and I’m happy to see it being spread throughout the mountain biking and equestrian communities. 1) Remember that your local equestrian club donates many hours of their time doing trail work too. Just because no one has ever seen them out investing their sweat and blood into improving the trails, much less heard of their clubs very existence, doesn’t mean it doesn’t happen. 2) Just because it’s too muddy to ride your bike on the trail, doesn’t mean it’s too muddy for a horse. Riding a bike in muddy conditions leaves ruts and tread marks, which negates the efforts put forth by the equestrian clubs who donate massive amounts of time to improving the trails. Horses, on the other hand, leave only pot holes ranging from 2″ to 8″ in depth and approximately 6″ in diameter. This is OK because unlike the tread patterns found on bike tires, these are ‘natural’ and don’t affect other trail users or the environment. 3) Next time you visit your local state or county park where a fee is required to use the trails, offer to pay double, or even triple. These fees are used to build parking lots which are helpful in accommodating large horse trailers and the diesel trucks required to haul them. More parking means you won’t have to park so close to a horse trailer, requiring them to dismount their horses and expel effort to move their vehicles. You should also ride to the trail head when possible to offset the emissions produced by said diesel trucks – it’s your responsibility to take care of the environment. 4) Last, but certainly not least, carry a roll of large heavy duty garbage bags with you. Equestrians often seem to be unaware of the long trails of defecation left behind them for other trail users to feast their eyes and noses on. When you find one, kindly offer them a large garbage sack and request that they backtrack their route and pickup after their animals. Surely, they will be happy to ad this to their list of contributions to the local trail systems which we all enjoy. I think many non-horse-savvy cyclists assume that because bikes are quiet, they aren’t scary to horses. WRONG… their silence actually makes them MORE scary, because unless the cyclist speaks up as soon as the horse & rider can hear him/her, bikes “sneak up” on horses, and most horses will do what comes natural to them – spook and try to bolt. After all, lions are silent when hunting, and as equines evolved the ones that didn’t run first and ask questions later did not survive to pass on their genes. Of course, equestrians should be alert when out on the trails, too. If I see another person on the trails, whether walking or cycling or riding a horse, I make sure they are aware of my presence before I’m on top of them. And if I need to stop my horse or move to the side of the trail because doing so is safer for everybody than me claiming my “prerogatives” on the trail as a horse rider, it’s not a problem. It’s simple courtesy. 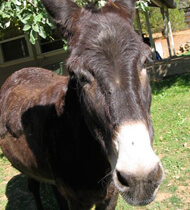 (2) ears back does not always mean the horse is upset. 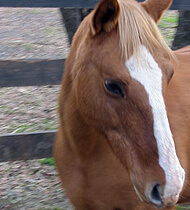 When riding in a group, the lead horse’s ears will face forward , the middle horse’s ears face to the side, and the last horse’s ears face backwards. This allows the group to have the most protection from predators as they are listening for danger in all directions. I have not really had a problem with bikers but I had problems with hikers that walk with a stick and or a back pack. Horses don’t understand why humans have 3 legs or a hump on their back. My horse grew up where there were Bears and that’s what he thinks hikers are. I ask the hiker to stop and start talking so my horse know they are human sometimes it works but more often I have to get off and ask them to go the other way till I have passed. Some might think that I should stay on and I have only to get unscrewed and fall. I have been in group where the first 3 horses did not spook but mine did. I think back to the Bear…I don’t know of any horse that does not spook at a Bear or a Bear friendly horse. This is great information! I’ve never heard of the article, even being from the Silicon Valley. But being an equestrian who shares narrow trails in the hills with bikers, this was very helpful! Riders are always safer and have more control on the horse than on the ground. Bad advice to say to dismount. Tyler – Yield means much more than “don’t run into”. A better definition would imply making sure that a the situation is taking the responsibility to see that each party is safe. I might agree that riders that can’t remount and horses that are excessively spooky don’t belong on a shared trail, the fact is that they are there and the bike rider is in a better position than the equestrian to yield. This may mean slowing, getting off, moving to the side or something else depending on the specific situation. “Yield” does not mean “stop and get off of the trail” It just means “don’t run into.” If a biker passed you on his bike and didn’t run into your horse, he yielded to you, and vice versa. I have horses too, and if you can’t mount and dismount your horse or keep your horse under control, you shouldn’t ride outside a controlled area. You also have to accept that sometimes you’re gonna have to stop your horse and keep it still. Spooky horses don’t belong on trails shared by others. I am an avid Mountain Biker and supporter of Mountain Biker Rights. I am also an avid Horseback Rider. The fact of the matter is, we all want to continue to use trails in our open spaces. Both groups work hard at maintaining our trails, and keeping our trails open. Being out on a trail is a very good thing! We are all out there to enjoy being out, to be in nature, to get some exercise. It doesn’t need to be an Us v. Them by any stretch of the imagination. It is a heck of a lot easier for a biker to just stop, get off and let the horse pass. It takes less than 2 minutes. Everyone is safe, everyone is happy. To get off and on a horse, especially if it is nervous, it not always so easy. My 10 year old daughter now rides both bikes and horses on trail and she gets that it is easy for both groups to get along…I can’t figure out why adults make it such a big deal! Bikers- If you want to go “balls out”- go to a mountain bike park, or go on trails where horses and hikers are not allowed. That is what I do when I have a need for speed. I used to raced downhill. I understand the need..but not when you can take out a hiker, a fellow biker, or a horse and rider. @ Carl – don’t want to harsh your mellow, or pull you out of ‘the zone,’ but maybe you should get on a horse once, and tell the group what that is like? I’ve ridden a bike, you can get on a horse, eh? Assume rooky rider and nervous horse until proven otherwise! More than a few times I’ve had bikers run up in front/behind me with out warning, and that will spook any horse. How horrible would you feel if you did something careless like that and got someone killed? I’m happy to share the trails, and will yield to bikers since they’re moving faster but let me know where you are! I will not dismount, but I will move out of your way when I can. 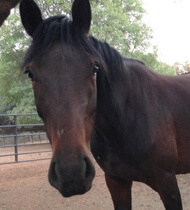 My horses read me, and if I’m not worried about something, they’ll stay calmer when I’m on them. So for the safety of EVERYONE, I will NOT dismount. And because I’ve had this happen to me: if you park your car directly behind my trailer, and I can’t get the boys in without moving, and the entire area is empty other than my rig and your car, I will shovel so much manure under your wheels you’ll get stuck. Just fair warning. Carl – please re-read all the comments about mounting/dismounting on the trail on a horse vs a bike…and reconsider what you think to be a reasonable compromise. I ride both horses and mountain bikes so I can speak clearly and with experience from both points-of-view. 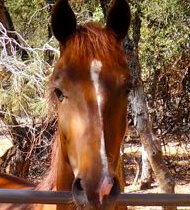 What I would ask of my equine friends is to work at having a horse that is more reliable on the trail by doing lots of rides that have minimal distractions (like no Mtn bikes, but maybe just hikers) and building that skill & confidence before taking a less inexperienced horse/rider to a trail that does have Mtn bikes. There should be plenty of those type trails to experience that can help build those skills for the horses. I even go as far to train my trail horses at home with a family member riding a bike near the horses to get them used to the sight. And then, take your horse (with another more experienced horse who has been around mtn bikes out together and will be less likely to be as reactive), to get the next level of experience and exposure. But I agree more that for the most part, horse riders are safer in the saddle for control than dismounting. While there is absolutely no horse that is bombproof (I wish that word would disappear from the equine lexicon), a good solid foundation can avoid or minimize accidents. (I have a great squirrel story that goes along with this!) As far as my mountain bike experience and insight, if you KNOW you are riding a shared trail, you have a responsibility to be more aware of the potential for interaction with horse & riders — so perhaps you make the sacrifice on just that day/ride to not wear headphones so you can hear more clearly, slow down on potential crossings, and make sure you follow alot of the suggestions mentioned in this article. On mtn bike trails that are dedicated, you have more lee-way on how you ride. Both sides can do their part to make it more enjoyable and safe for all. Here in the Mid-Atlantic states EVERYONE yields to equestrians. At least the signs indicate that. This doesn’t work 100%, but it is pretty good. We also have a coalition of bikers and riders, a formidable force, for trail creation and maintenance. Through training and encouragement my young gelding has accepted bikes, and now doesn’t always let me know when a bike is behind us. Other times we see the bikes coming down the trail, and they don’t see us. If I was riding a Tiger, they would be eaten! One comment thought that horse riders should dismount when crossing a bike trail. Sounds good, but I’m a senior & can’t get back on my horse if I dismount. Maybe mounting blocks should be added at these crossings. There’s a lot of us seniors riding. That is a good question Carl. I, for one, recognize that the bike rider is always going to go much faster then me and I always yield to them. 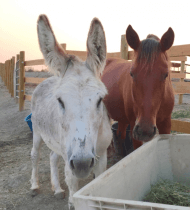 From a forester’s perspective, they do not want horses off the trail….several horses will damage more vegetation then the mountain bike getting off the trail. From an equestrian perspective, it is best to keep a nervous horse moving. I personally think the slower user should yield. Hikers yield to me and I yield to mountain bikes…I am not threatened by sharing the trail. However, there are a lot of older heavy women that say they can’t dismount and get back on….there are also a lot of women that ride that are afraid of everything while they are in the saddle! Those type of equestrians usually are found close in to horse camps and not in the “back country” anyway. Your hardier equestrians are not effected either way…..have a good trail riding season! It’s extremely easy for a cyclist to dismount. It’s also easy for an equestrian to dismount… it’s the mounting that gets tricky. Horses are TALL. Stirrups are short. Scared horses are fidgety and can be very difficult to mount. Like the article pointed out, some cyclists and riders are novice. We are riding a live animal with emotions please try to cut us a break. Thanks! Carl – Dismounting and remounting a horse is much more difficult and problematic than on a bicycle. 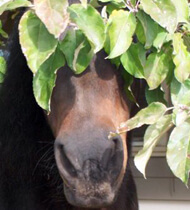 Depending on the trail it may be nearly impossible and remounting itself can spook a horse. Bikes never get spooked. For everyone’s safety it is best to yield to the hose and rider – and this gives one rule of thumb for all situations. BTW – I ride both bikes and horses. Multiple use trails can easily be used by horses and bikers. Bikers, make yourselves known by speaking up when you see a horse and rider ahead of you. Talk, sing, recite the Gettysburg Address, just make some kind of noise so the horse is aware of your presence. Step to the downhill side of the trail, horses feel threatened by unknown things that are higher than them. Most riders have more control over their horses when on board, not on the ground which is why they don’t generally dismount. So, smile and wish everyone a good day and that is what you will have! Thanks for your time. Hope everyone has good experiences on the trail. Carl, it’s a lot safer and much easier for the biker to yield. Bikes don’t move until you tell them to. Horses have a mind of their own. It is not as easy to mount a horse on trail as a bike. Depending on the size of the horse, type of tack and the terrain if I dismount I could be walking for a while which would definitely slow us all down. In theory, asking equestrians to dismount and yeild on “risky” sections of trails at times sounds fair. Until you realize that dismounting and remounting a horse are not nearly as simple as they are for someone on a bike. Add to that a nervous or frightned horse and it gets dangerous to be climbing up and down the side of a large animal that cant/wont stand still. Also, once a rider is on the ground they tend to have even less ability to control a horses body (since they are only holding onto a rein attached to the horses mouth) than they do while mounted (where they are able to use their feet/legs, body weight and both hands to cue the horse). Most equestrians (at least those I have ridden with) are more than happy to move to the side of the trail when space permits to allow bikes or hikers to pass. Especially when a biker gives a verbal heads up that they are coming up behind us, and gives us a chance to prepare our horses, and move to the side of the trail. We dont want bikers stuck behind us at our slower pace, where they might make our horses nervous so we move over as soon as we are able. We are all out on the trails for the same reason, to enjoy the ride! No reason for there to be drama if we all have a little respect for each other. Because when your horse is near 6 feet tall and you’re on top of that, it’s practical for a biker to get off their bike over a rider dismounting on a trail. Is it more difficult for a biker to get off a bike or a rider to dismount from their horses so the biker can zoom by? Why shouldn’t equestrians be asked (in principle) to dismount upon crossing paths in “risky” sections of trails, in order to reduce possible injury due to a horse’s flight response? 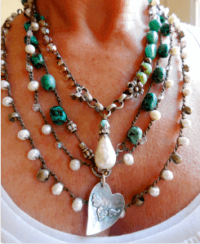 We all gotta give a little… why not equestrians? Correction: RIDE RIGHT – Pass on the left and otherwise ride on the right. Sorry to dispute but I have been taught to “RIDE RIGHT” meaning pass on the left and ride slowly on the right. Nice article, but I would like to point out one very important flaw in the article that could be very serious. Etiquette requires bikers and hikers to yield on the downhill side. Horses are threatened by things on the uphill side and on a steep slope I am not about to pass on the downhill side where the horse could go off a bluff and kill us both. Also horses tend to go up hill when they bolt, so either way they go somebody gets hurt.